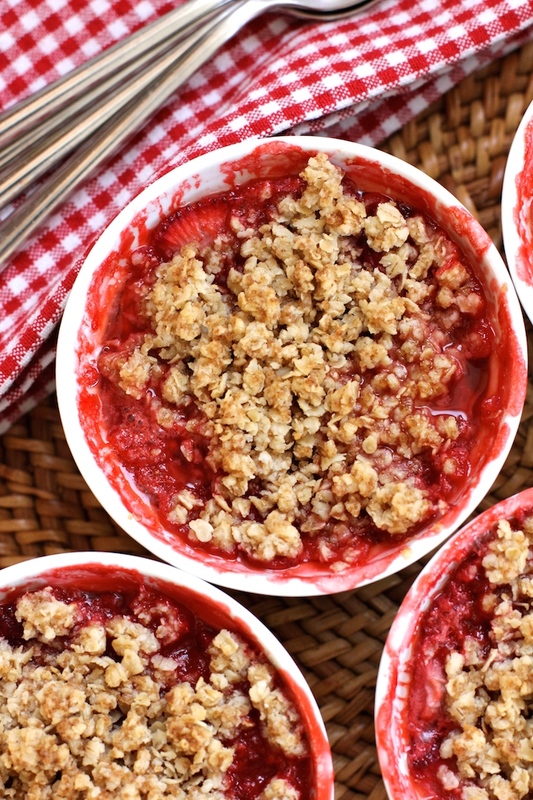 This strawberry crisp is an easy, crowd pleasing summer dessert. 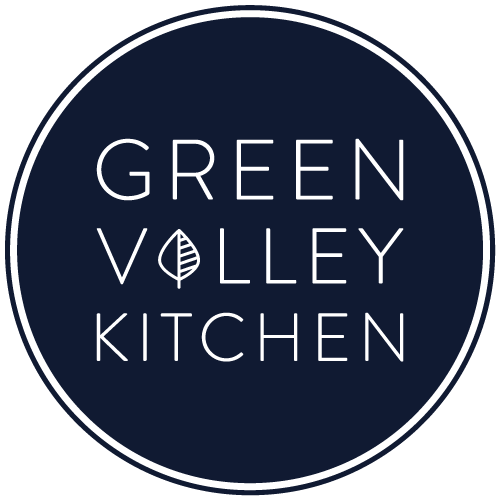 It’s a simple recipe that uses fresh, ripe strawberries that are baked with a crumbly, crisp oat topping. It’s the perfect summer dessert for a get together with friends on a hot summer day. This is a warm, juicy, fruit filled dessert. It smells heavenly while baking. It’s easy to make and a really crowd pleaser. 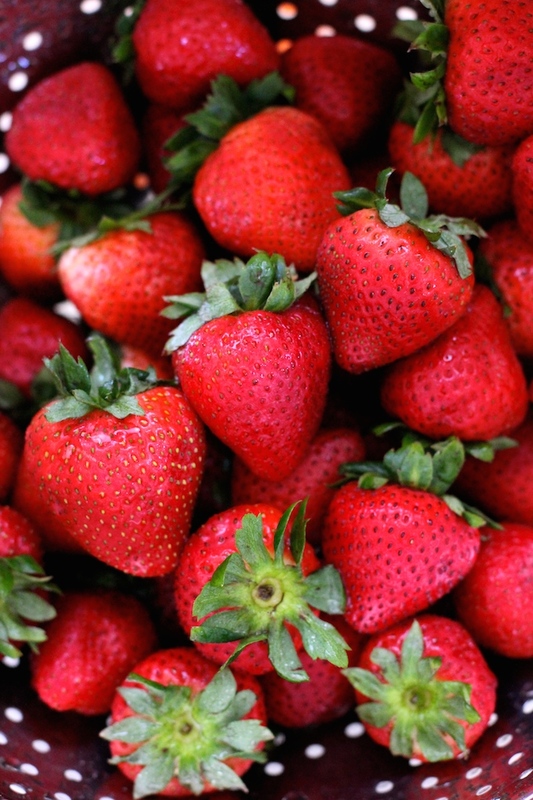 Fresh, ripe strawberries are mixed with a little sugar, lemon and cornstarch. Next, you add the strawberry mixture to a serving dish – in my case I used four 8 oz ramekins – then top the fruit with the crumbly, buttery oat topping. Once in the oven, the strawberries will release their juices, thicken and bubble up and over the crispy oat topping. The juice will spill over the sides of your serving dish, so make sure to line your baking sheet with some tin foil for fast and easy clean up. Once cooked, you want to let your strawberry crisp rest for about 10 to 15 minutes before serving. It’s best served warm or at room temperature. Add a scoop of vanilla ice-cream and you’ve got the perfect summer dessert. If you enjoy this recipe, come back and leave a comment and a rating. I love hearing what you thought of the recipe! A sweet, summertime strawberry crisp. 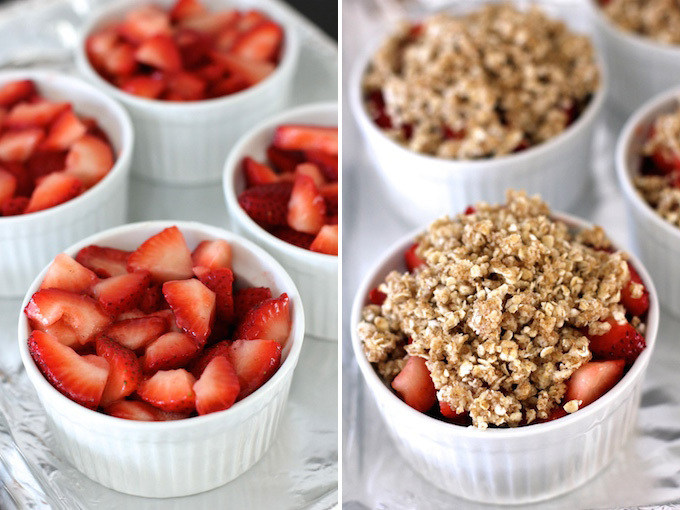 Packed with ripe strawberries and topped with a buttery oat topping. An easy, crowd pleasing dessert. Add cane sugar, corn starch and lemon juice to sliced strawberries in a large bowl. Stir to combine and set aside. Add quick oats, flour, brown sugar and salt to another bowl. Stir to combine. Add softened butter to oat mixture and using a pastry blender or your hands to blend/cut the butter into the oat mixture. Continue blending/cutting the ingredients until the butter is incorporated into the dry ingredients – making a chunky crumb topping. Butter 4 individual 8 oz ramekins. Fill each ramekin to the top with the strawberry mixture and then gently spoon the the oat crisp topping over the strawberries. Put the filled ramekins on a baking sheet covered in foil. Bake in the oven for 25 to 35 minutes – until juices have thickened and bubble over and the oat topping is a golden brown color. Let rest for 10 to 15 minutes before serving. I made four servings using 8 oz ramekins. The dessert is easy to double if you are baking for a larger group – just double the ingredients. The fruit will cook down a bit, so you want to fill the serving dish all the way to the top with fruit. Then gently mound the oat topping on top. Don’t flatten or pack down the oat topping on top of the fruit – you want it to be a light, crumbly, crispy topping. The strawberry crisp will be juicy. As it cooks it will bubble up and over your serving dish so make sure to place the ramekins or dish on a baking sheet lined with tin foil for easy cleanup. This is so 5 Star. Addded little extra sugar as it’s early in strawberry season. Delish. Thanks so much, Jean – glad you enjoyed it! And thanks for leaving a comment and a rating – much appreciated! This strawberry crisp looks and tastes great, easy to make and pleases everyone. Yes! This is so easy to make – a real treat. Thanks for leaving a comment and rating! Do you think this would work with thawed frozen berries? I picked and froze a bunch of strawberries this spring. Hi Bridget – I haven’t tried making it with frozen fruit. I googled it and there are a lot of recipes that use frozen fruit so it should work out. Let me know if you try it and it was a success. Can you use an 8 x 8″ pan instead of the ramekins instead? Hi Barb: I haven’t made this in an 8×8″ pan. I don’t think there would be enough filling. Maybe try doubling the recipe? I’m not sure though. I only have regular white sugar, can I use this instead? And, would it be the same amount. Hi Elle – sorry for the late reply. Yes, I think white sugar should work fine. Please let me know how it worked out. Hi Bridget – I wouldn’t make the filling ahead of time. If you add sugar to the strawberries and let sit for a long time, the strawberries will release a lot of juice and break down. You can slice the strawberries ahead of time and then add the sugar, corn starch and lemon juice right before baking. Hope you enjoy it. Does this need to be refrigerated after it cools? I would assume so but seems like the crispy topping woulf get soggy. Any info on this? Hi Tracy – this is best served after cooking. The topping will lose it’s crispness if refrigerated. This strawberry crisp looks insanely delicious. I’m in hopes I can try to make it this weekend as it looks like the perfect dessert for a hot summer weekend. Thanks for sharing! Thanks, Jenn. It’s such a super, easy dessert – hope you try it! Thanks, Kennedy – I haven’t tried a blackberry crisp before – putting it on the to do list! I’ve never tasted a strawberry crisp before but now that I see yours I wish I had one right now! I love how the strawberries stay so bright and red! I need to keep a lookout for cheap strawberries! Thanks, Izzy – definitely keep your eye out for cheap strawberries – or any other berries you find on sale – you can make this with any type of berries. I absolutely love strawberry desserts – they scream “summer” to me. This looks amazing, Geraldine! I love the beautiful red color and that buttery topping. There’s nothing else like a fruit crisp, is there? I hope you are having a wonderful summer! Thanks so much, Julia – hope you’re having a great summer in SF! 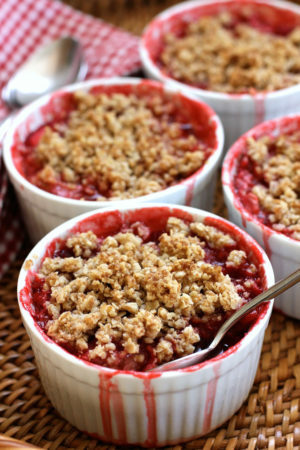 Gahhhh this strawberry crisp look amazingly delicious.. love that crispy oaty topping.. yummm!! Thanks, Arpita. I agree about the crispy topping – it really balances out the sweetness of the fruit as well. Thanks, Denise. Aren’t crisps the best – you can use up any berries that you have hanging around and it works really well using a combination of berries as well. I usually just buy whatever is on sale – the markets seem to have a special each week for different berries. This is such a favorite of mine! Simple and delicious…just as everything should be in the summer! You’ve nailed the photos, once again! I feel like I could just grab my spoon and dig right in…only wish it were true!! Thanks for such a scrumptious recipe, Geraldine! Thanks, Annie. I agree – simple summer desserts are the way to go! Oh yes! Perfection and simple. Love Summer desserts like this and everyone gets their own individual serving container! The best! I can just imagine a big scoop of vanilla ice cream with these warm crisps; melty goodness! Thank you for this Geraldine. Local Strawberries are just nearing their end…so I’ll have to grab some for this! Thanks so much, Traci. My local market had strawberries for $1 a pound – so I couldn’t resist! Someone please hand me a spoon so I can dig into this! It looks so crisp, yet juicy and delicious! YUMMMMMMM!